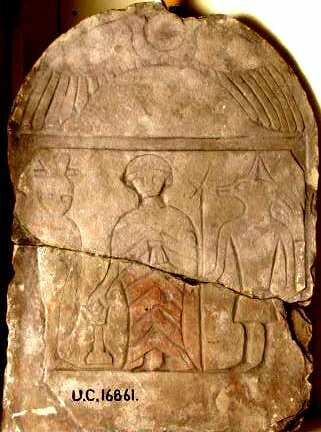 This object is a stele or stela, being a plaque made of wood or stone that often contains both lettering and images. 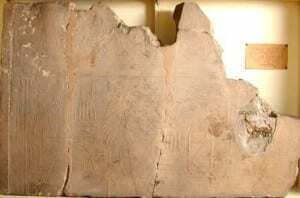 These objects are found far and wide across the ancient world, with the Greek and Roman examples often being free standing monuments (such as those at the Keramaikos), whereas Egyptian stele often form part of a wall. Stela often denote tomb ownership (a bit like modern gravestones), or relate to specific temples, royal decrees (Promulgation stelae) or border markers. a multi piece scarab, very colourful! 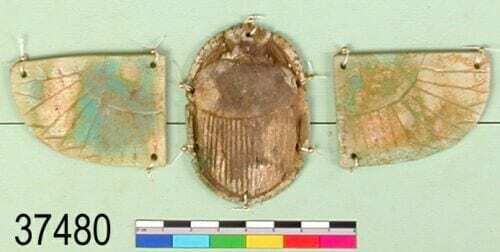 This piece pre-dates the stele by about 1,000 years and is an amulet with the body of the scarab with two wings, originally attached by wire. The reverse of the scarab is plain, some have loads of intricate images and text on, suggesting that this piece was deigned to be worn flat, with the carapace of the beetle facing outwards. The suspended wings would allow it to smoothly follow the contours of the wearer’s collar bone, incorporating the winged pendant into the wearer’s form. The scarab was a symbol of the gods Kephri and of Ra, a symbol of the sun, life and the heavens. The body is very anatomically accurate, the smooth exoskeleton, limbs and pincers all seem pretty accurate, so why these massive wings with feathers? Was this a zoological error on the part of the sculptor, or something a bit more symbolic? To answer this, we must turn to our second specimen: the vulture. Big, winged, famous for their appearance in Disney’s Jungle Book, vultures would have been a common sight to the Ancient Egyptians. However, like the scarabs, they hold a more symbolic importance as well. Another stele depicts this fine specimen, with his wings at a 90 degrees, his head in the stylised profile of pre-Hellenic Egyptian art. The vulture was a symbol of royalty, and protected under Pharonic law (Ingerson 1923 etc.) making them a sacred bird. Vultures even had a place in the language of Egypt, used to make a glottal –a- sound. And fuse them together we get the vulture winged scarab that denotes both the King and Ra, tying together the mortal and heavenly worlds in a powerful protective symbol. 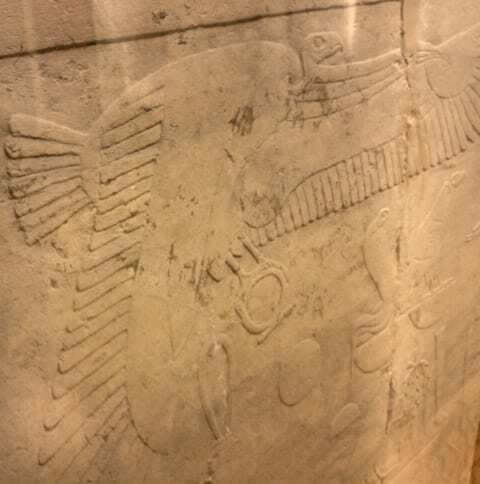 Perhaps having the vulture symbol on you would even suggest you are protected by the Pharaoh, just like ‘his’ birds? Considering this fantastic romp through iconography that Gombrich would no doubt enjoy, what does this mean for Petrie’s 19th/20th century viewers? The scarab seems well attested to Egyptian religion, even Darwin labelled the entire genus as being “the sacred beetle of the Egyptians” (Origin of Species,103). London Zoo is accredited to one of the oldest aviaries, the raven cage opened in 1829 and the new developments have continued with a Birds of Africa enclosure opening in 2005; birds would be recognisable to the visiting public and the vulture would be an iconic image of Africa and the exotic foreign. That is to say these exhibits do not just portray an exotic specimen for the Victorians to ogle at and enjoy, but are an active facet of the “triumphalist culture” of Empire (Parry, 1987, 39). This is some rather heavy hitting theory stuff, but it is still interesting. These two objects are clearly Egyptian and Afro-centric, denoting exotic animals not found in Britain in a stylised ‘Egyptian’ manner. Displaying a specimen, such as a vulture, in a British cage may make statements of Empire, but is the winged scarab perhaps performing a similar action. Consider our first stele, the winged scarab is arching over the Roman, altar and two deities; is the commissioner making a statement about his power as well? Is the Egyptian Empire, perhaps, making an artistic fight back against a Roman cultural incursion? Next time I shall be placing our final animal in the magnificent Petrie Menagerie. Ending on the crocodile, perhaps the most notorious member of the Egyptian Zoological scene, we will look at how he relates to the monsters and eye of ownership as portrayed in E. Nesbitt’s The Amulet and Lewis Carroll’s Alice in Wonderland. See Sir A. Gardiner’s Sign List for a more explicit, and far better description of the hieroglyphs and their usage.